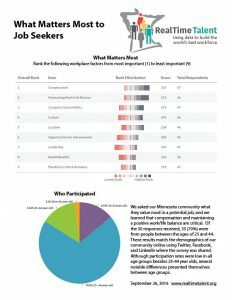 We asked our Minnesota community what they value most in a job, and overall the responses are what you might expect: compensation and maintaining a positive work/life balance are critical. However, we noticed some interesting differences between job seekers of different age groups that suggest compensation may not be the first thing that younger members of the workforce are seeking; many seem to value the flexibility to work remotely and working for a cause they can believe in more than money. echo other studies on the topic. Please take our results as a fun, casual look at what job seekers in the RealTime Talent community value most in their place of work. It would be wrong to assume that compensation is the first thing that all job seekers pay attention to when considering a new job. In fact, our survey suggests that maintaining a healthy balance between work and life activities and seeking a company with a positive mission may be more important to some young job seekers. 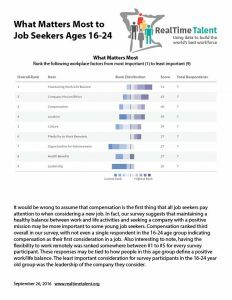 Compensation ranked third overall for young people, with not even a single respondent in the 16-24 age group indicating compensation as their first consideration in a job. Working remotely is also a unique value of young job seekers. 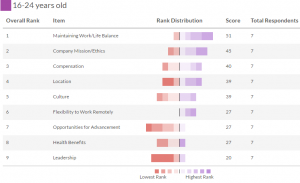 Every participant in our survey ranked workplace flexibility somewhere between #1 to #5 in importance. These responses may be tied to how people in this age group define a positive work/life balance. The least important consideration for survey participants in the 16-24 year old group was the leadership of the company they consider. 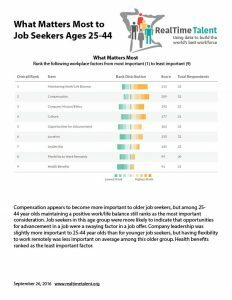 While compensation appears to become more important to older job seekers, 25-44 year olds still report that maintaining a positive work/life balance is the most important consideration. 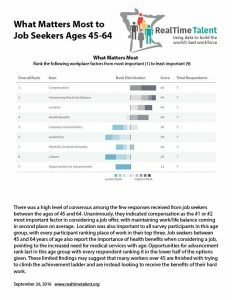 Job seekers in this age group were more likely to indicate that opportunities for advancement in a job were a swaying factor in a job offer. Company leadership was slightly more important to 25-44 year olds than for younger job seekers, but having flexibility to work remotely was less important on average among this older group. Health benefits ranked as the least important factor. 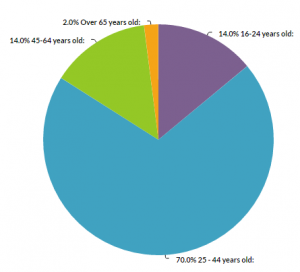 There was a high level of consensus among the few responses received from job seekers between the ages of 45 and 64. 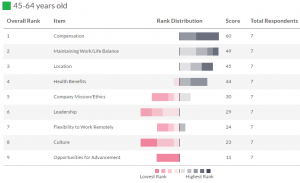 Unanimously, these participants indicated compensation as the #1 or #2 most important factor in considering a job offer, with maintaining work/life balance coming in second place on average. Location was also important to all survey participants in this age group, with every participant ranking place of work in their top three. Job seekers between 45 and 64 years of age also report the importance of health benefits when considering a job, pointing to the increased need for medical services with age. Opportunities for advancement rank last in this age group with every respondent ranking it in the lower half of the options given. These limited findings may suggest that many workers over 45 are finished with trying to climb the achievement ladder and are instead looking to receive the benefits of their hard work. Based on these results and the few studies cited above, it is impossible to determine whether these differences in job seekers focus are a result of changing values and roles as workers age, or signs of broader generational differences. There have been many hypotheses lately on the differences between Millennials, Gen X-ers, and Baby Boomers in the workplace, with hundreds of firms fighting for their place in a $150 billion global HR consulting space. However, other studies suggest that the generations may not be so different after all. 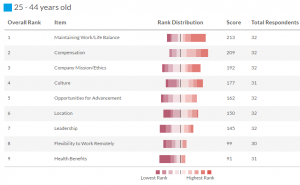 IBM’s Institute for Business Value released a report in 2014 based on 1,784 employees across the globe that found workers across all generations share similar workplace values. Nationally, CNBC found similar results in 2015. Multiple studies have found that across generation, race, and gender, employees tend to want the same things out of their work. Instead, it seems to be the importance of each factor and the way that these factors are defined that shifts with age and life stage. Many studies show that compensation is still the most important factor for employees at work. However, generational shifts have been observed regarding other relevant workplace factors such as work culture, ability to work from home, and health benefits. RealTime Talent is interested in knowing what is most important in a job to Minnesotans. Respond to the question below to add your perspective, and check back in a few weeks for the results!